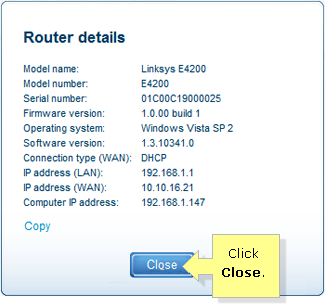 This article will guide you on how to check the details of your Linksys wireless-N routers or wireless-N gateways using the Linksys Connect software. NOTE: To launch Linksys Connect using a Windows computer, go to Start > All Programs > Linksys Connect. To launch Linksys Connect on a Mac® computer, navigate to the Applications folder in Go, and then start Linksys Connect. For more information, click here. The Router details window will show you your router or gateway’s model name, model number, serial number, current firmware version, IP addresses, and other important details about your device. 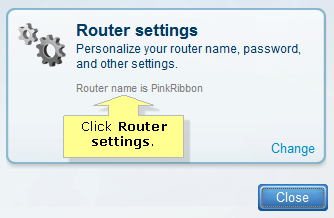 NOTE: In this example, E4200 router is used. 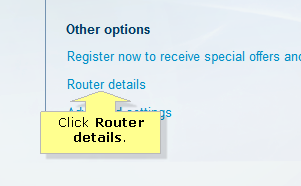 NOTE: If you want to access and view the advanced router or gateway’s details, such as wireless settings and security, click here for instructions.